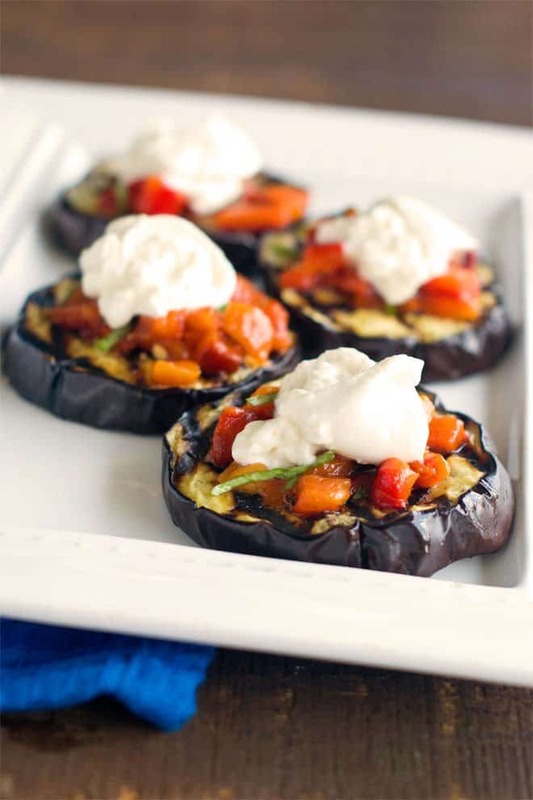 For this delicious gluten-free bruschetta recipe, grilled eggplant slices are used instead of bread. The bruschetta topping is made of roasted peppers, basil and garlic. Creamy burrata cheese makes the whole thing decadent and fabulous. This post is sponsored by the Georgia Fruit and Vegetable Growers Association. Now that we’re in the real deep heat of summer there are fresh veggies popping up all over the place. All of this produce hanging around puts me in a creative mood which is how I came up with this Eggplant Bruschetta with Roasted Peppers and Burrata. 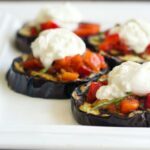 The eggplant is such a simple, gluten-free and keto substitute for bread and it’s a great way to use it up when you have a bunch. With this recipe, I wanted to use ingredients that are currently in season. I also wanted something fun for summer. Like a great summer appetizer to have at a patio table by the pool. I suddenly remembered being at our 4th of July party and having the idea of grilled eggplant slices as the base for bruschetta (instead of bread or toast). I HAD to do it. Now, what to put on top of that bruschetta? Ah-ha sweet peppers would be perfect. I like to make my own in the slow cooker, here’s my recipe for that, but jarred, roasted red peppers work great. Just be sure to look for a jar that doesn’t have sugar or vinegar in the ingredient list. Citric acid is fine. Minced garlic, fresh basil salt and pepper gets piled onto the eggplant rounds and then for a special finish…we put a smudge of burrata on top of each one. If you don’t know burrata it’s essentially fresh mozzarella that’s been stuffed with cream. No joke. Use regular fresh mozzarella if you can’t find it. Nearly as good. There you have it! A fresh, fun produce-packed appetizer perfect for summer nights by the pool. Make sure you pick up some eggplants, bell peppers or other delicious fresh produce next time you’re at the store. You definitely won’t regret it! For this delicious gluten-free bruschetta recipe, grilled eggplant slices are used instead of bread. The bruschetta topping is made of roasted peppers, basil and garlic. Creamy burrata cheese makes the whole thing decadent and fabulous. Trim ends off eggplant and slice into 6 ¾-inch slices. Brush each side of each slice of eggplant with ½ teaspoon of olive oil. Sprinkle each side with a pinch of salt and a grind of black pepper. Preheat grill to medium. Add eggplant slices. Grill for 3-4 minutes per side, spinning halfway through on each side to get hashtag grill marks. Remove from grill and allow to cool. In a medium bowl combine peppers with basil, garlic, ¼ teaspoon of salt and ¼ teaspoon of coarse black pepper. Pile mixture onto the eggplant rounds. Cut burrata into 6 pieces and use a spoon to scoop each one and it onto a mound of red pepper. Disclosure: I was compensated by the Georgia Fruit and Vegetable Growers Association to write this post and share it on my blog and on social media. All opinions are honest and mine. Check out the #fruitsveggiesandfreedom hashtag on social media for more recipe ideas! This post originally appeared in July, 2016 and was revised and republished in June, 2018.